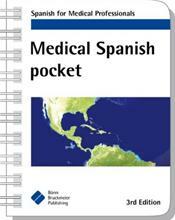 The Medical Spanish pocket is a vital communication tool for anyone working with Spanish.speaking patients. 3rd edition, completely updated. Handy reference for your communication with Spanish-speaking patients. Clearly organized by history and physical examination with specific in-depth questions and phrases appropriate to each medical specialty. Clearly organized by situation: interview, examination, course of visit. Provides hundreds of essential words and phrases, ready to use. For students, residents, nurses and all other healthcare professionals.